Cut egg cartons apart to make your own Mancala game. Paint them or cover with pretty papers and you have a custom made and worthwhile game that two people can play. I am making mine for my classroom. I have cut apart the egg cartons and will have students at school paint them with paints that the art teacher feels would work best. The only other thing I need for the games are 24 little stones for each game. I may use beans or poker chips that I have at school because stones are rather difficult to find under a few feet of snow. What is Mancala? It is an ancient game from Africa that is mathematically significant for your children to learn. I am not even going to bother any of us with the mathematics but if you like, you can have your children talk about strategies the will increase their chances of winning. It is a rather complex game to learn, but once you learn you become addicted. I used to know how to play years ago but I had to learn all over again in order to write this post. You cannot overemphasize the importance of game playing for mathematics learning and for family relationships. If you click the Mancala Snails image above, you will be taken to an online, free version of Mancala. It is the easiest way to learn how to play. Just choose "beginner lever" and play until you begin to develop strategies. There are many variations of the game, but stick to the basics that are in Mancala Snails. The rules used there are accurate and true to the real game. It is said that Mancala is the historical precursor to chess. I know for a fact that children love to play this game because they always ask me to get one for the classroom. 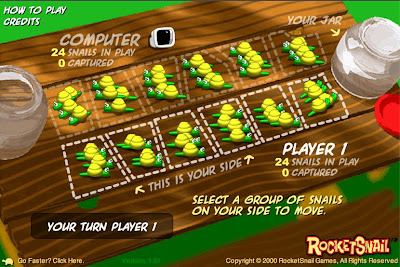 Now I enjoy playing the computer at Mancala Snails when I am tired and just want to relax. Possum is still a bit startled by the mess about her and hopes I take the cartons to school in the morning. Oh, we have that in the Philippines too. I used to play it when I was young. Now I'm not even sure if I remember how to play it right. We call it Sungka here. That looks like so much fun for the kids. I think that i am going to have to try out that site with my boys later thanks. I've heard of that, but never played it... I'll have to learn... I love math and would like to teach my boys to enjoy it, too. I'll give the online version a try when I get a minute. THanks! This will be fun! That's funny that you chose Mancala, because that is what my daughter wanted to do with the egg cartons too. We have a Mancala game and you are right that it is addicting. I'll have to give that online version a try. Love the pictures of Possum by the way. What a pretty cat she is! Buddy and Charlie are usually the photo hogs aren't they! I haven't come across mancala before. Off to check out the online version now! Oh! I had a friend who went to Africa when I was in college and taught us all how to play when he got back. I haven't played in years, I'm going to go to that online site right now and refresh my memory.